Main frame is 69” square x 244” tall. Frame sections are 4” square x 1/4” wall structural tube, all welds continuous. Seal Master™ bag spout access chamber includes 12” diameter discharge transition with 8” diameter flanged outlet. Rear of chamber includes 4” diameter dust take off stub with cap. Unit features an 8” diameter rotary valve with guarding and a nozzle for flexible connection to drum filler inlet. 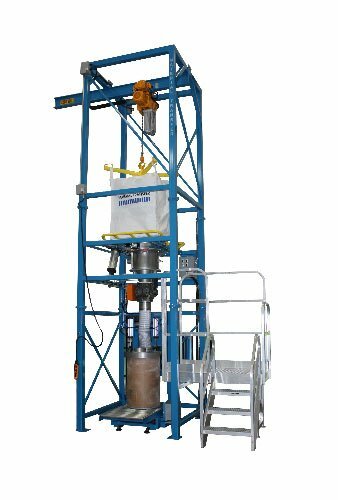 Drum filling frame is manually adjustable and includes an actuated fill head, gravity roller conveyor, and densification system. Drum filler features an NTEP approved gain-in-weight scale system with a digital weight instrument, load cells, and a 4-20ma output module. Unit includes an ergonomic operator work access platform for easier access to bag spout chamber.